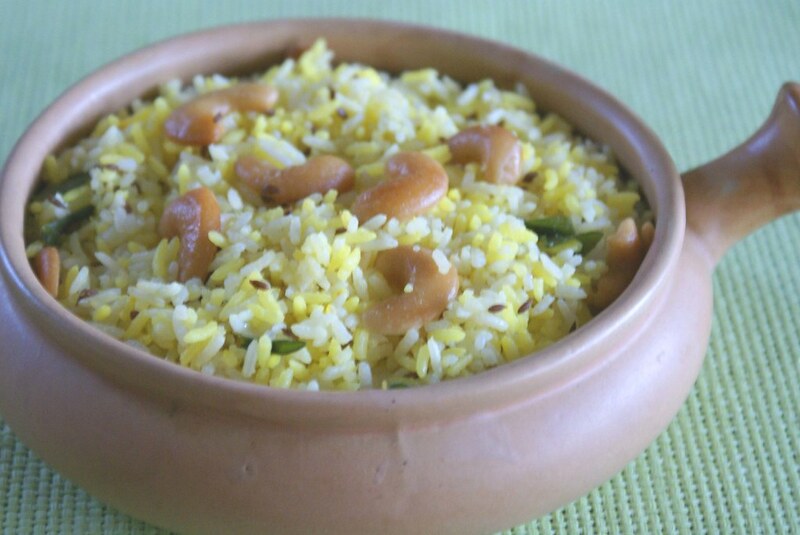 Apart from Jeera Rice, Saffron Rice or Kesar Chawal goes well with the wide variety of spicy Indian dishes. It is also very appealing to the eye, with its pleasant color. As someone rightly said “White rice is nice, but yellow saffron rice is stunning“. Steep Saffron in warm milk for a few mins. Cook rice with water, cardamom, cloves, salt. Add even the saffron and milk and turmeric or color(if using). 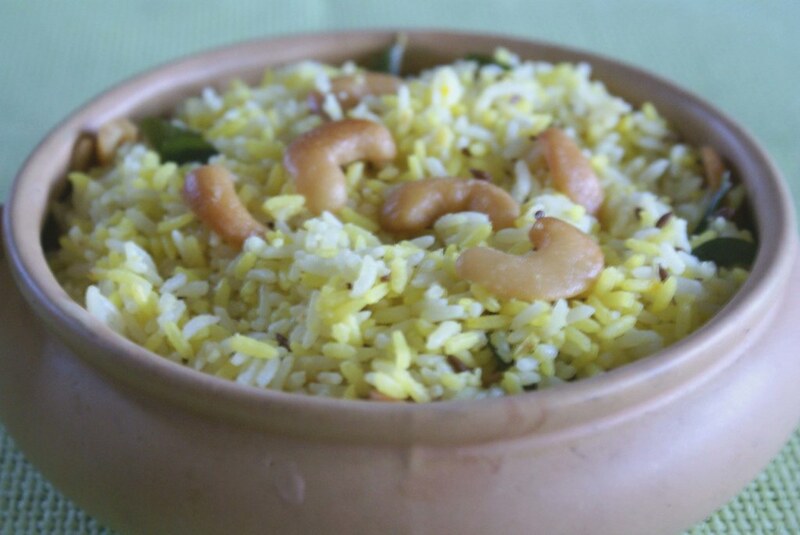 Take ghee in a small kadai and add cashews after golden, add jeera and curry leaves. Add this to the cooked rice. It is a nice substitute for the routine jeera rice or ghee rice. Saffron adds the rich flavor and color. I served this with butter chicken, and it was a nice combination!! This is my entry for the Think Spice : Saffron event being hosted by dear Sunita of Sunita’s World. Love them. I am sure if you have guest and make both the rice and the butter chicken they will be pretty impressed. Very nice n simple spanz…Loved your cute pans too..
saffron rice with butter chicken!! wow now i say that is heavenly!!! Saffron rice, and that too with butter chicken…that’s soooo very tempting indeed…and those serving bowls look gorgeous too. Thanks for the entry. HappyCook, Yes, there is no doubt that the guests will be impressed! Sirisha, Thank You so much, I am glad u liked it. What a simple, yet flavorful rice. That is one cool Kesar/Saffron Rice. Luv the Butter chicken too. Great recipes. Even great cool Snow layout.. wow!!!! excellent one …yummy rice …never made it at home ..will try it soon ..
Can you believe I’ve never had saffron rice. I need to rectify that soon! Kesari Rice in that lovely pot looks so grand. I loved the combination with Butter Chicken. You are a great cook, would love to munch on that chicken one day.. what do u say? wow thats a great combo.. love to have this anytime. You have a nice blog and mouthwatering recipes. 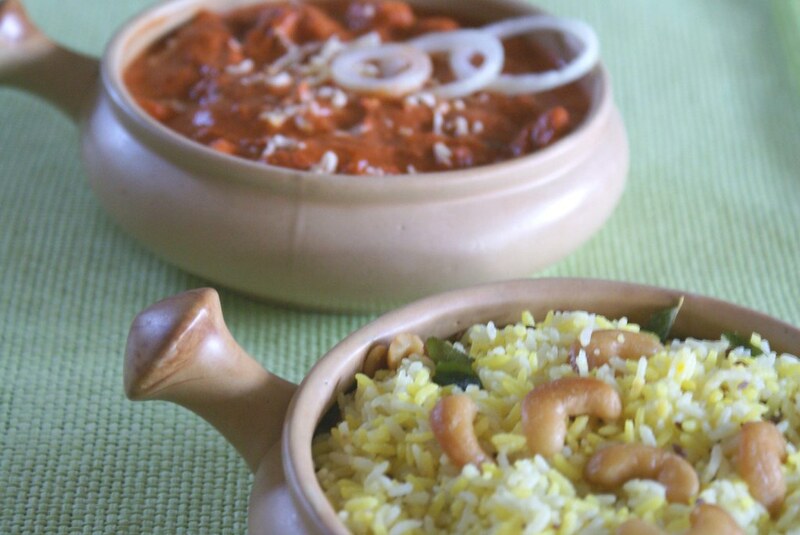 Loved reading your blog, especially “pure Hyderabadi” one:). Saffron rice looks delicious. Will keep visiting for updates. Colour looks tempting to make it! !And as u hav said it will be a rich substitute for the regular ghee and jeera rice…:)Thanx fro the recipe! gr8 recipe. truely nice variation for jeers rice. will try it. Rice is such a comforting food! I always save and enjoy any recipes I find using rice.